Description: Collection of Tablets of Bahá’u’lláh (includes one work by Mírzá Muhammad `Alí). 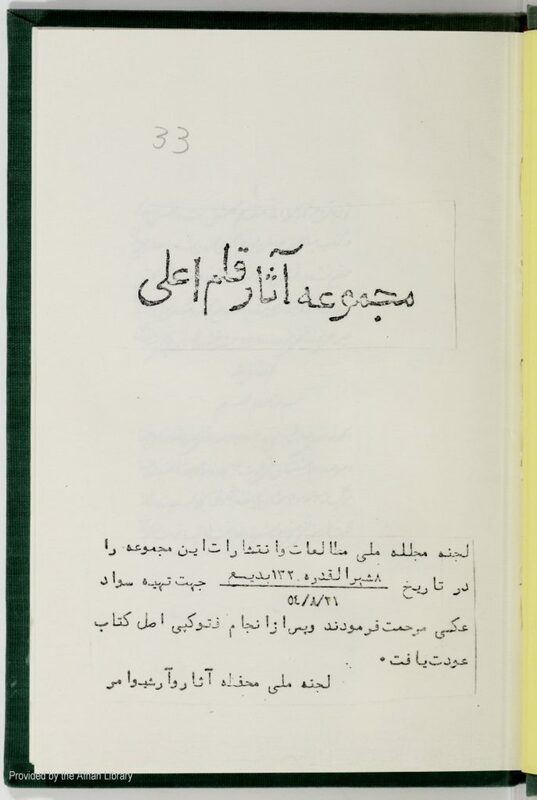 Includes Sharh Kitáb-i Hayákil-i Váhid addressed to Mírzá Ibráhím Muballigh (p. 1); Tablet of Visitation for three martyrs of Zanján (Basir, Mírzá Muhammad `Alí and Ashraf) (p. 29); a Tablet of Visitation for the martyrs of Zanján composed by Mírzá Muhammad `Alí (p. 31), first part of Kalimat-i Firdawsiyyih (p. 44), Seven Valleys (p. 101), Fire Tablet (p. 148), The Fire Tablet (p. 147), Tablet of Visitation for Baha’u’llah and the Bab (p. 157). Handwriting changes on p. 36 and p. 143. From p. 143 to p. 156, there is Persian inter-linear translation of the Arabic. Manuscript, 161 pp. (164 pp. of PDF).